Can You Really Be Immune to HIV? HIV invades our immune cells — the very cells that are supposed to protect us from disease — dismantling our body’s immune army in the process. A weakened immune system can’t fight off HIV … or many other diseases, for that matter. The virus attacks by interlocking with receptors on the surface of certain immune cells. Most strains of HIV attach to two receptors: CCR5 and CD4. Think of them like a doorknob and a deadbolt. The virus unlocks the deadbolt and turns the doorknob to enter the cell. But some people have a mutated, shriveled version of the CCR5 receptor. Although HIV can unlock the deadbolt, it can’t get its hand around the tiny knob to turn it — and is shut out of the cell. It will bounce off like debris, eventually swept away by the immune system’s garbage trucks. About 1 percent of people of European descent have two copies of the mutated CCR5 gene — one from each parent. They are often said to be “immune” to HIV infection, but there are strains of HIV that have found another way to invade immune cells. Instead of using CCR5 as their doorknob, they use a receptor called CXCR4. So it’s misleading to talk about “immunity” to HIV — different strains of the virus take advantage of different weaknesses of our immune systems. At best, there is immunity to certain strains of HIV, but not all of them. Who Has Been “Cured” of HIV? In the decade since Timothy Ray Brown was declared HIV-free, he was the sole member of a very lonely club. “I’ve been waiting for company for a long time,” he said to the New York Times. Last month, Brown got his wish when researchers trumpeted the case of the “London patient,” who had a type of blood cancer called Hodgkin’s lymphoma. He received a bone marrow transplant from an “immune” donor in May 2016 and stopped taking antiretroviral drugs in September 2017. His immune cells stopped expressing the normal CCR5 receptor, and doctors haven’t been able to detect HIV in his body. At this point, however, it’s too early to wave around words like “cure” — “long-term remission” is the researchers’ preferred terminology. Researchers had long hoped to duplicate Brown’s success in a cancer patient. What took so long? For years, patients would either die of their cancer (up to 40 percent of bone marrow recipients don’t survive the first year), or the HIV infection would come roaring back after discontinuing antiretrovirals. Researchers wondered if Brown’s especially aggressive treatment had been a necessary step. Additionally, Brown had one copy of the mutated CCR5 gene — inherited from one parent, but not both. A single copy of the mutated gene wouldn’t make him “immune,” but did it give him just enough resistance to help his donor immune cells wipe out whatever HIV lingered behind? The London patient helps answer these questions. His treatment was far less aggressive, involving just a single bone marrow transplant and no radiation at all. Furthermore, the London patient was born with two normal copies of the CCR5 gene, indicating the extra “boost” of a single CCR5 mutation isn’t necessary. How Does a Bone Marrow Transplant Work, Anyway? 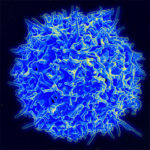 Immune cells, including this T cell, are made by bone marrow. We have many different types of blood cells, including a whole army of specialized immune cells, all of which are manufactured by our bone marrow. When someone comes down with blood cancer, something has gone wrong, and their marrow produces malfunctioning, cancerous blood cells. A successful bone marrow transplant from a healthy donor enables them to start pumping out healthy blood cells again. HIV can lie dormant in bone marrow, only to wake up from its slumber at a later date — which is why people living with the virus must take daily medications to keep their infections in check. Brown’s doctor found a compatible donor with two copies of the CCR5 mutation, meaning that he wasn’t only able to start manufacturing healthy, noncancerous blood cells — he was also equipped to produce immune cells with the mutated CCR5 receptor, making it impossible for remaining HIV to infect new cells. So Can HIV Be Cured Now? There are millions of people with HIV worldwide, and they can’t just sign up for a bone marrow transplant and be cured. It’s a dangerous procedure. The body recognizes donor tissue as “foreign,” attacking it rather than welcoming it, and drugs with serious side effects coax the body into accepting this new tissue. Even after the body has integrated the donor cells, patients may suffer serious long-term consequences. Antiretroviral drugs are much less risky. Additionally, patients can’t receive bone marrow from just anyone — donors must be compatible. If a match can’t be found within the patient’s family, compatible donors are sought outside the family, often from donor registries. The pool of compatible donors is already small, so it’s especially difficult to find one whose immune cells are also impervious to HIV infection. 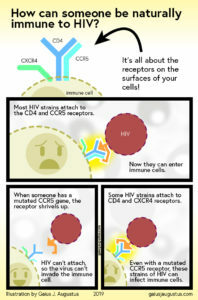 And don’t forget that there are strains of HIV that don’t use the CCR5 receptor. For example, someone known as the “Essen patient” was treated for lymphoma using methods similar to those that cured Brown. Unfortunately, some of his HIV used the CXCR4 receptor instead of CCR5, allowing that strain to take over. The Berlin and London patients’ cases provide inspiration to those hoping to develop new drugs that block the CCR5 receptor, or gene therapy, which in theory could help patients produce cells lacking CCR5. Brown’s dream is that he’ll see a universal cure for HIV in his lifetime, and persistent medical research can help make that dream a reality. Any Planned Parenthood health center can help you reduce risk of transmitting or acquiring HIV. We offer condoms, HIV screening, education, and preventive medication, and can connect you to treatment if you test positive for the virus. This entry was posted in Sexual Health and tagged acquired immune deficiency syndrome, acute myeloid leukemia, AIDS, antiretroviral drugs, Berlin patient, bone marrow, bone marrow transplant, CCR5, CCR5 delta 32, CCR5Δ32, gene therapy, genetic mutation, HIV, HIV/AIDS, Hodgkin’s lymphoma, human immunodeficiency virus, immune system, leukemia, London patient, radiation, STD Awareness, stem cells, Timothy Ray Brown by Anna C.. Bookmark the permalink.